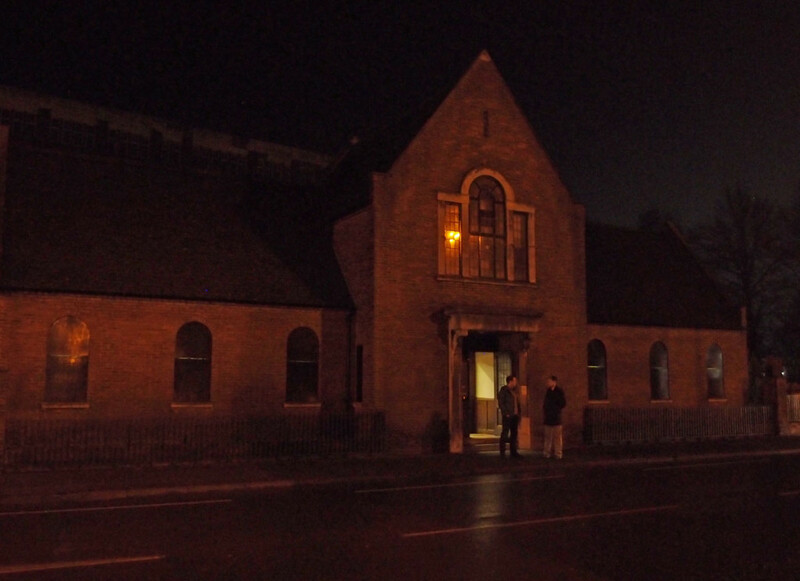 A cheering sight — a building that has been boarded up and unused for years pictured here with its front door open and the lights on. 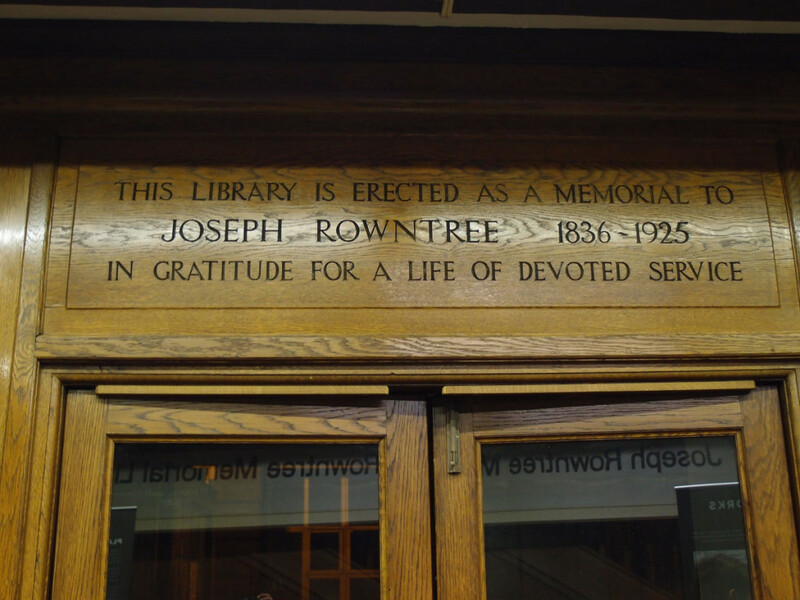 Not just any old building, but the Joseph Rowntree Memorial Library. 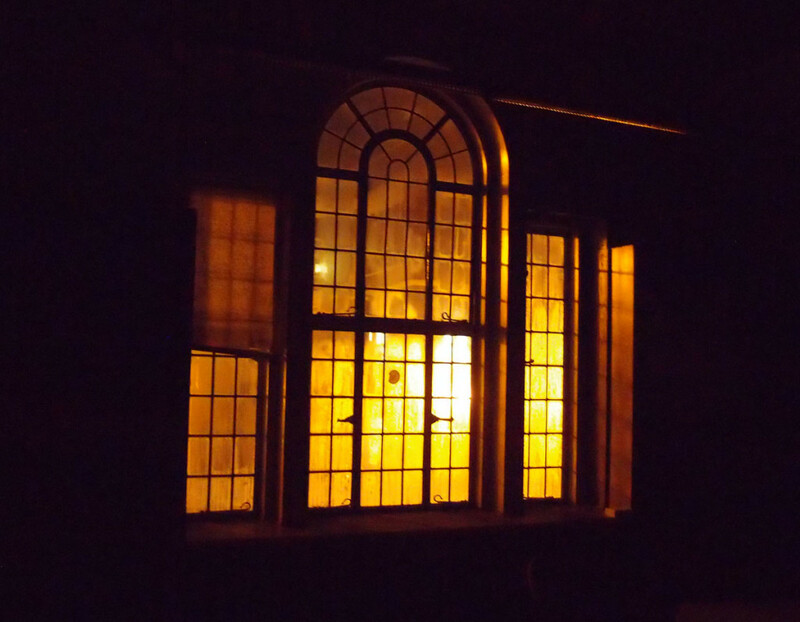 Looks welcoming, doesn’t it, on a dark winter night. Last week, for one day only, it was open from 3pm-8pm for an exhibition of plans for the Cocoa Works development. Last week I wrote about that, and illustrated it with some of the images from the display boards. But I also took photos of the building itself, as it’s the first time I’ve been inside it, and it may be the only chance local residents get to see inside it, depending on whether it has any community-based use in the future. 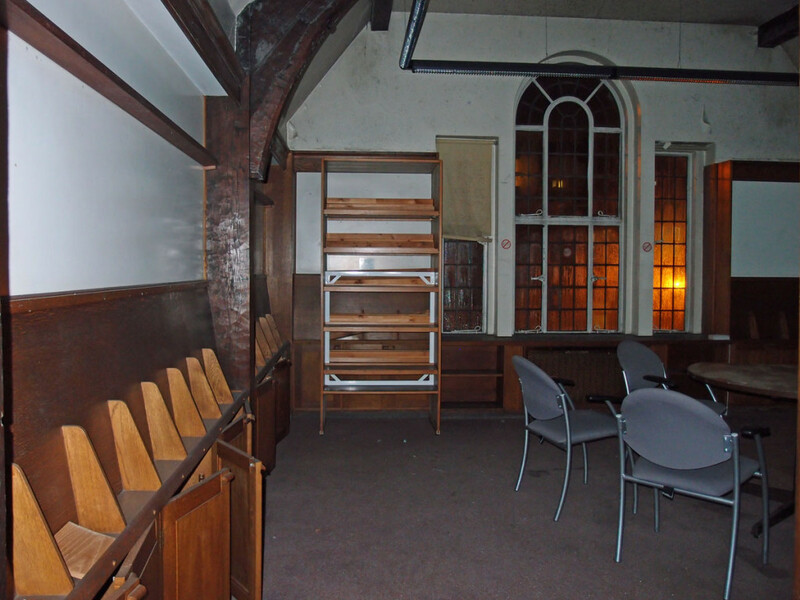 There are no books here now, but the shelving remains. Here’s a view of the ground floor area to the left as you enter. 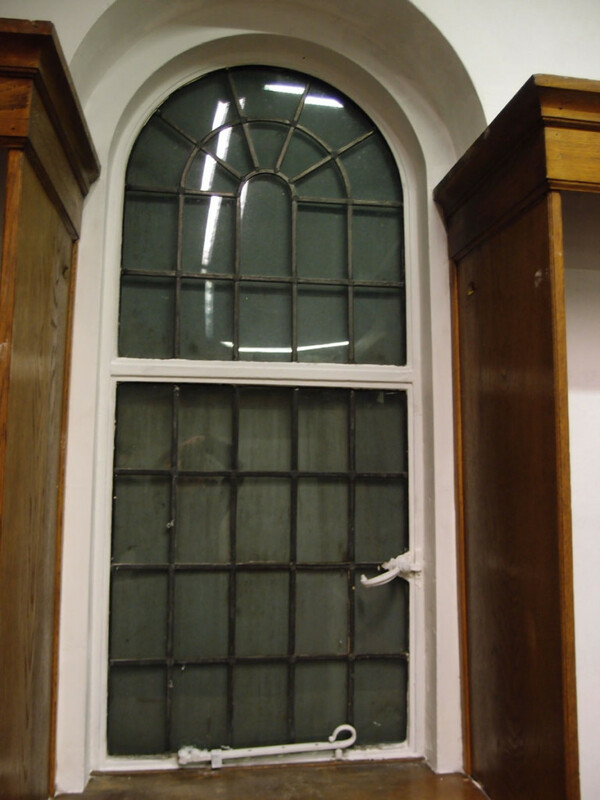 The windows are metal-framed and leaded. 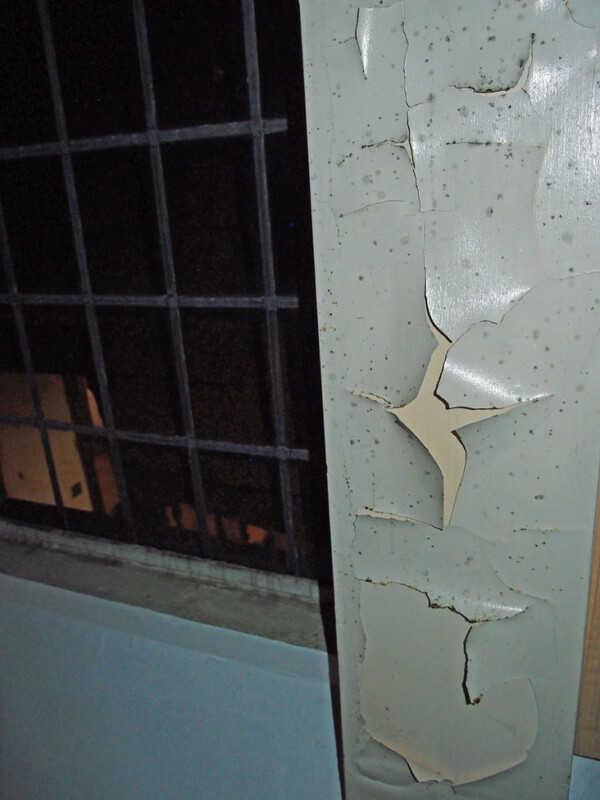 The larger window at the end had signs of damage, as if there had been some attempt to force it, from the outside. 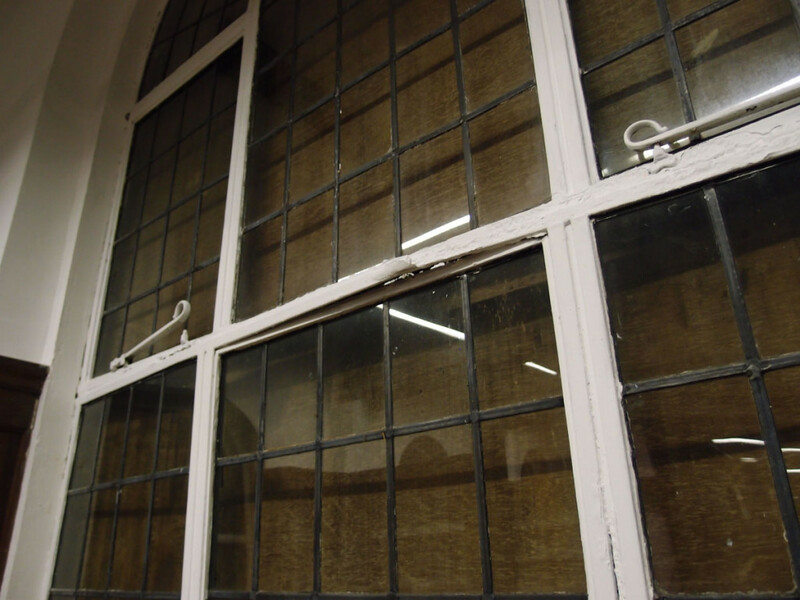 The windows are boarded up now. 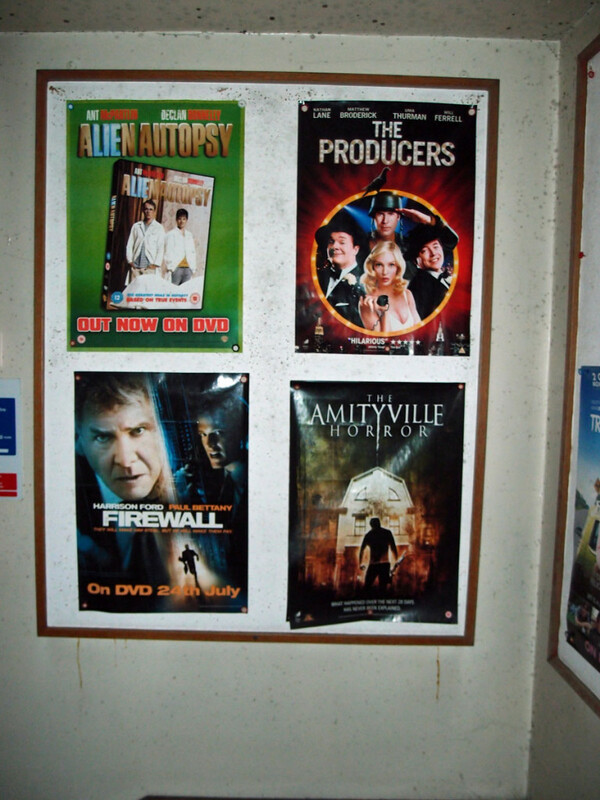 On the stairs, a few framed posters. The exhibition was downstairs only. Upstairs, without lights on, I had to rely on the camera’s flash. Just a small compact camera, so not a powerful flash, but it illuminated enough to give some idea. 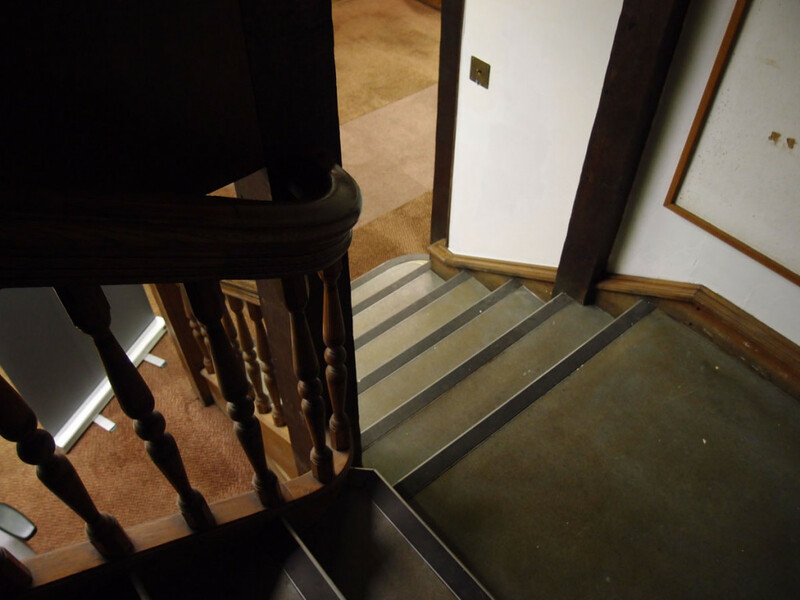 In the photo above we’re at the top of the short flight of stairs, looking in to the first floor room, facing the front of the building. The room has fitted magazine racks and cupboards. There’s also another inscription, which I didn’t see, but which is quoted in the listing entry. … and a sudden and rather impressive view of the main factory building behind, looming out of the gloom. I’ve had to digitally enhance the image, it was more grey as I saw it, just enough light behind the factory for it to be visible as a bulky presence on the horizon. 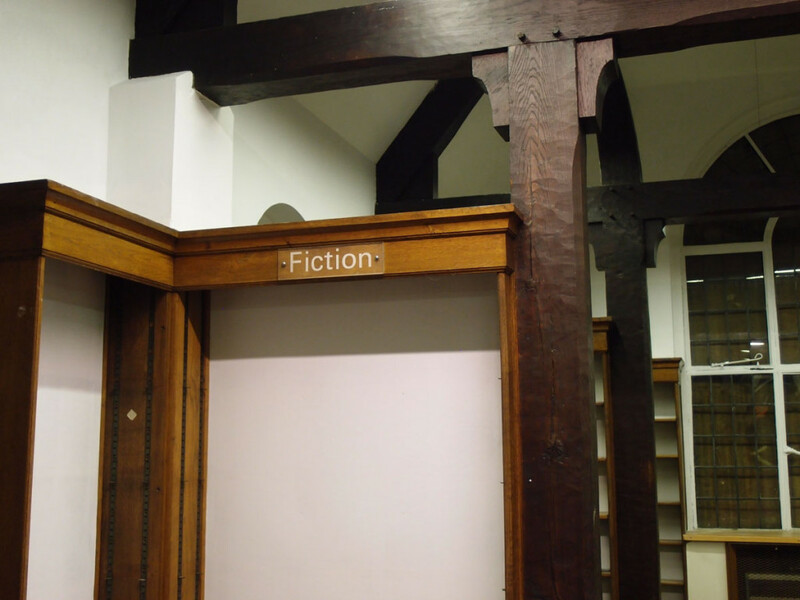 So much of a contrast to the building we were in, but of course linked to this little library, and so many other buildings here around the factory. Down the stairs then, back to the ground floor. 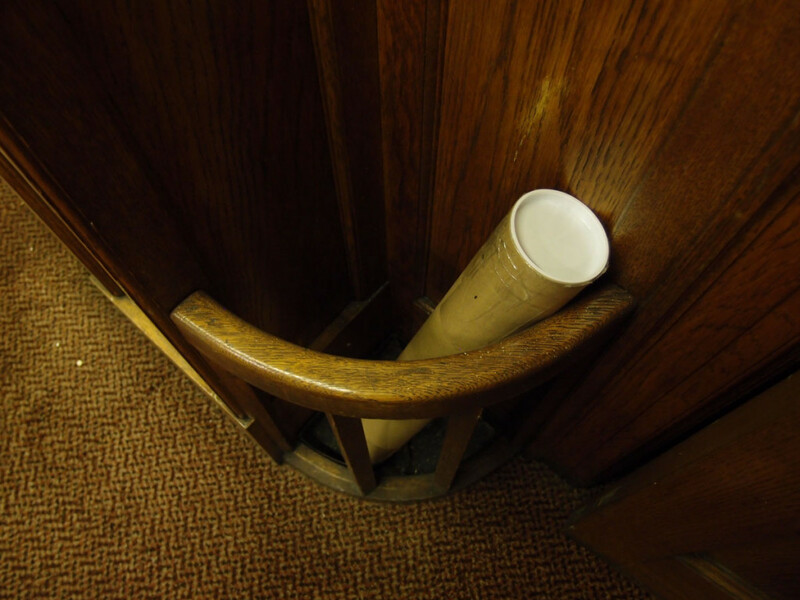 And by the door, as we left, a cardboard tube drew my attention to an elegant curved umbrella stand. I did include this next image on last week’s page — an inscription just above the entrance. I’d been in the building a while before I noticed it. An inscription above the door but facing into the room, meaning you see it as you leave, not as you enter. A gentle reminder of what this building is about. It was good to see the interior of this building, after knowing it only as a closed and boarded-up place. 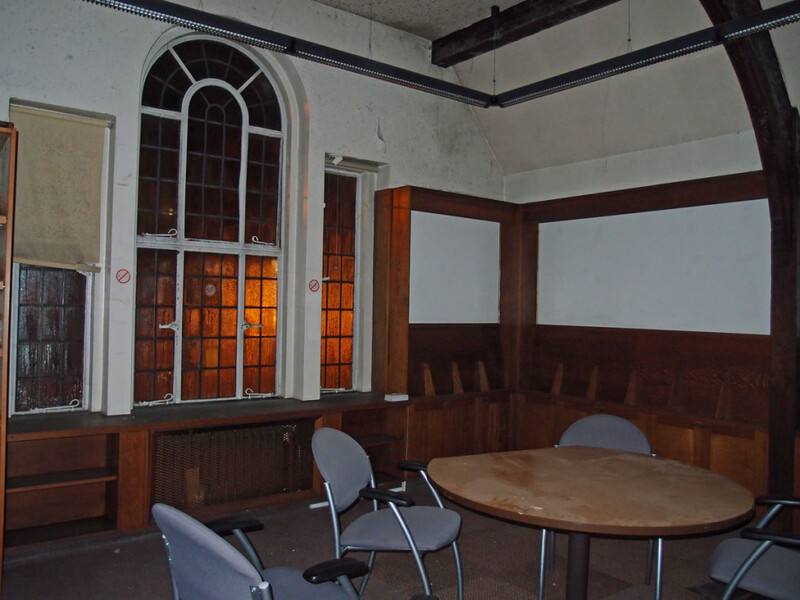 I wonder if that room upstairs could be kept for community use in some way, as perhaps a bookable meeting room for small local groups, or if it could at least remain open to visitors interested in the Rowntree legacy and the history of these buildings here. I hope too that the view from the window on its stairs will remain unobscured, as it’s so impressive. 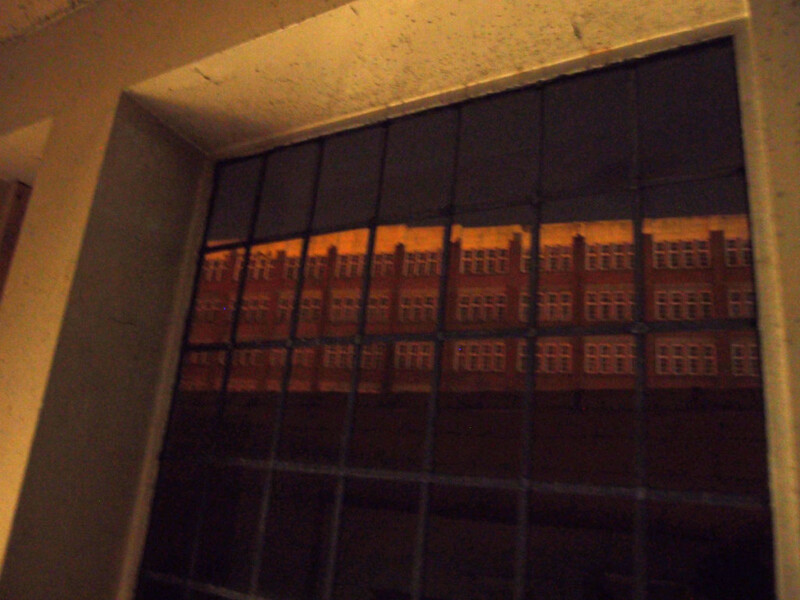 A massive functional factory building framed by a small leaded library window. So different, but so much linked. Reminders of the Rowntree legacy and rich Rowntree heritage here in this part of York. This is EXACTLY why I love your site. Your knack in uncovering the obscure and giving us a glimpse into a hidden-in-plain-site world is a major contribution to the fabric of York. 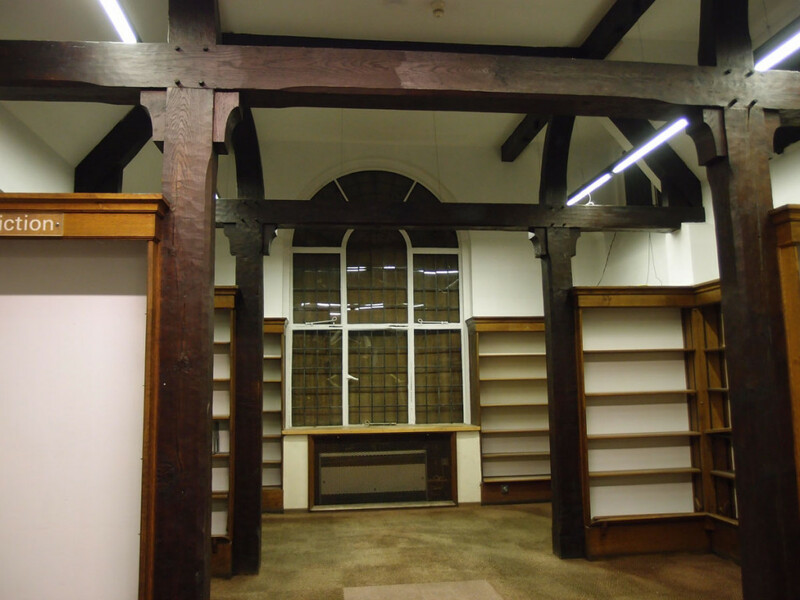 I used to cycle past the library fairly regularly on my way to visit relatives in Earswick and often wondered what the inside was like. Heck, I even worked at Rowntree’s as a student in 1971 and never managed to get in! Thank you Lisa for “knocking one off my bucket list”. 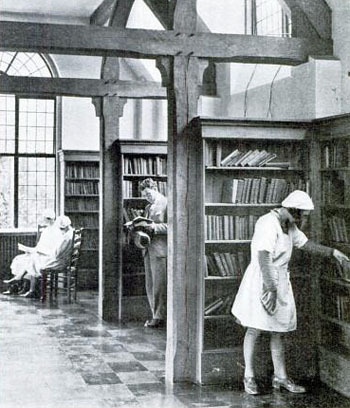 I used the library to add to my formal education which had ended at 15 in Dec 1962 aged 15 . As well as the books it furnished one with newspapers of various shades and magazines . All this helped to expand minds and thoughts especially helpful for me as my background was working class and books were a luxury and not present in great numbers within the home. As I worked for a number of years in the Dining Block office facing the Library this is the building we looked out at every day spring , summer autumn and winter . It is possibly also forgotten that between the Dining Block and the Library but underground is a deep and wide tunnel. This was the route used by the factory staff to access the catering areas to avoid crossing busy Haxby Road. Does any one know if that still remains? The Rowntree family really were pioneers in social conscience with their efforts to improve the lives of their employees. If only it could be said today of the present owners ! I’ve also heard since posting this page that the library had records – or as we’d probably have to call them now ‘vinyl records’ – ie music, to borrow? We need these reminders of what the Rowntree family and others like them provided, and I hope that the same values will live on, always, in some form or another. Thank you very much for posting this article. My great grandfather, Fred Rowntree, was the architect for this building and I’ve never been inside so it’s great to see the photos. Sadly there’s no proof but it’s generally thought that he also did the cafe in Rowntree Park which ironically is now a reading room connected to York’s central library. I know we have the Lutyens War Memorial in York but how dull is that compared to a memorial library or park that can be enjoyed and loved by so many people? I see that Sam comes from the Scarborough branch of the family cousins to Seebohm . Google tells that he was also involved in the old central offices of the York Works and indeed Yearsley baths. I have experience of both. My cousins and granny lived in Kitchener Street and in the school holidays staying with them meant early morning swimming , cold but great fun . Always full of noise and activity and where often you would pass Sir Donald Barron who would always acknowledge any he met on his factory rounds. 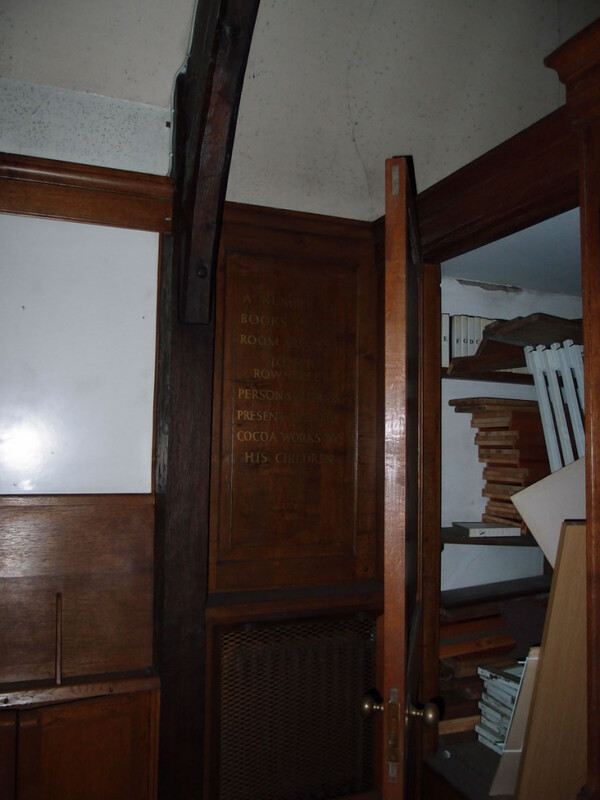 There was a balcony going all the way round it leading into well appointed directors rooms as well as the Board Room. With a huge central table . It was inevitably full of cigar and cigarette smoke when you entered . What a fantastic little gem for future generations to enjoy!